In a pickle for a new workout? 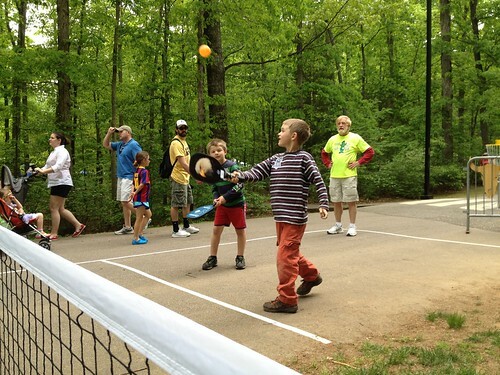 Have you tried Pickleball? I’m always open to new ways to incorporate exercise into my life, so during a recent gathering of my close friends, we started talking about new ways to get outside and stay active. I was surprised to discover that there is a sport out there that I am completely unfamiliar with. So I’m wondering, why have I never heard of “Pickleball” before? Pickleball is a hot craze in several states and it sounds as though it is becoming popular in the state of Michigan as well. It was explained to me in this way, Pickleball is similar to tennis because it’s played with a tennis-sized net but on a badminton-sized court, 20 feet wide and 44 feet long. Yet it is also similar to ping-pong because you use a paddle to keep the plastic ball going back and forth over the net. The pickle ball is larger than a ping pong ball but looks like a wiffle ball. Pickleball paddles are made of an array of materials from plastic, wood, graphite or aluminum and vary in price range. Again, they resemble a ping pong paddle but slightly bigger. The game is known to be relatively inexpensive to get into and pretty easy to learn too, which is why I just had to learn more about it. After watching a few videos along with listening to some friends explain the game to me, it sounds and looks like great fun! It’s similar to the game of tennis but is more accessible to a wider range of individuals. The main difference is the speed of pickleball, it moves at about one-third the typical speed of a tennis ball. That, plus that fact that the court is just under one-third of the total area of a tennis court, it makes the game much easier to play than tennis. The ball is served overhand or underhand and is not allowed to go more than four feet over the net. Points are scored by both sides and occur when the opponent fails, meaning that he/she allows the ball to stop bouncing or falters while hurdling over the net. It’s pretty awesome to hear people talk about this fun game as they continuously stress that pickleball is played by all ages, shapes and sizes. Everyone loves it! The best part is that pickleball provides a great workout and it by the sounds of it, it has the power to keep you motivated for more. There have been some recent articles stating that pickleball is the fastest growing sport in America. One reported that elementary, middle and high schools are trying to develop leagues because they view the sport as an excellent way to get kids moving and exercising more, as well as discussing the importance of nutrition and good health with the students. In case you want in on the action, here are the places where pickleball is being played here in Michigan, quite possibly in your neck of the woods. And please, let me know if you have a favorite sport to play outdoors that I might not know about. I love adding new activities to my walking routine! It is a great exercise for balance & agility. But to get the workout from a good hard walk, I don’t believe it compares . You do need to have excellent range of motion with your arm in order to be able to each the balls.